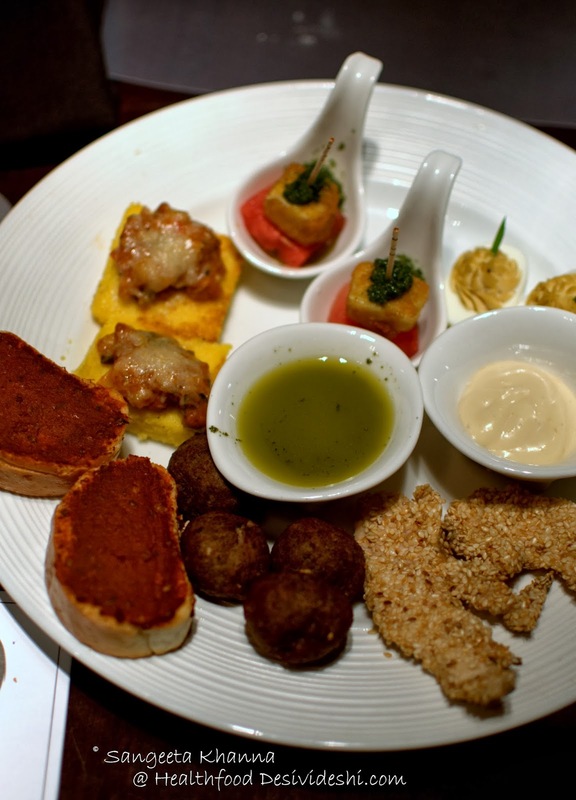 A Mediterranean food fest is going on at The one, Le Meridien, New Delhi and I decided to go there after a tough trek in the Garhwal range of Himalayas last week. We were exhausted and deprived of good food during the trek and a healthy rejuvenating kind of eating out sounded just right. Le Meridien has invited Chef David Zelnick to bring the varied cuisine from Greece, Turkey, Southern Italy and Spain and he did a wonderful job of bringing the cuisine to it's pristine best. I find the cuisine generally refreshing in flavors and it was a good decision to go for it as I found many favorites at the festival. The One at Le Meridien is a pleasant lobby level restaurant (operating 24*7) that overlooks the beautifully lit up entrance alley at night and greenery and tall towers and buildings on the Ashoka road in the day time. The plush interiors felt cozy even if the place was buzzing with guests. The Mediterranean menu keeps changing everyday at the buffet, Chef David introduced us to some of the interesting salads and stews that he had brought to the festival. I loved the 'Recovery Chicken' that his mother used to make and I requested the recipe to which he obliged. I am sharing the Recovery Chicken recipe with you later in this post. I found most of the food healthy and nourishing, the salads and stews were great and the risotto and spinach lasagna were absolutely flavorful. Some of those starters were interesting too. The Chicken tenders with a horse radish mayo dip was being prepared on the live counter and it was great when served hot. A bit dry when cold so have it hot with the yummy dip. The sesame crunch and sharp horseradish mayo make a great pairing. I loved the deep fried feta cubes with water melon slices topped with coriander salsa, it felt like a flavor bomb, sweet and salty, soft and crunchy all together. Arvind loved the Spanish deviled eggs while I told him to try those Italian meatballs with coriander and olive oil salsa. I could make a meal of these meatballs and the coriander greens salsa, I know it will be made in my kitchen very soon. My utmost favorite will be the polenta squares topped with a ratatouille and melted parmesan. Very soft yet grainy polenta shallow fried just right so it's not too greasy, topped with a flavorful mix of vegetables. Polenta and vegetables often make my meal at home as well. Garlic bread was really good though bread and crostini are not my things. There were better things to enjoy than just bread. 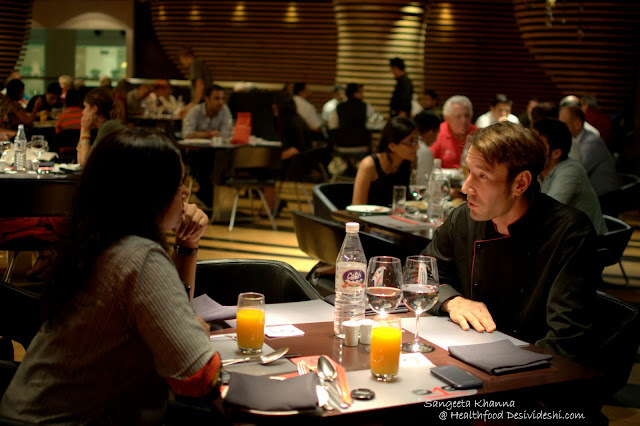 I had a long and relaxed chat with Chef David and was delighted to know that he considers India as his home though he has traveled, trained and worked all across the world. 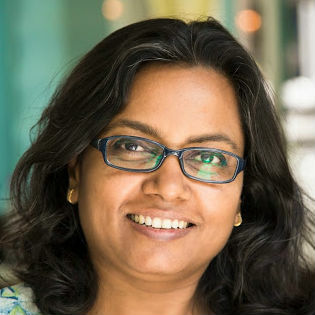 He was born in Pondicherry and still works there, he loves Basmati rice and loves all coconut based curries be it south Indian curries or Thai curries. Much like my own favorite flavors I would say. He introduced me to this wonderful salad that he had prepared. 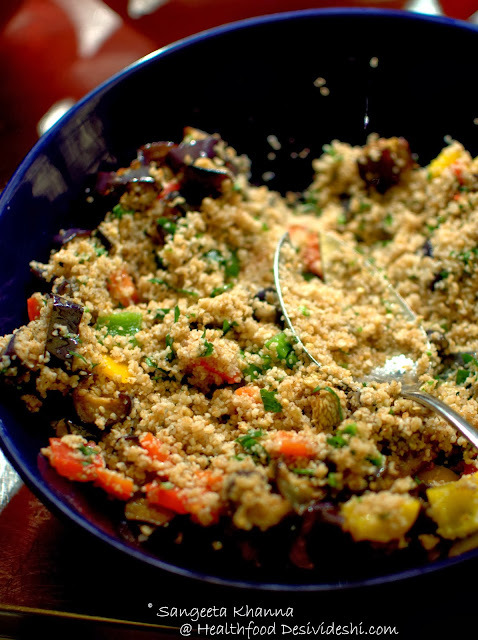 Barley groats (almost like couscous) salad with roasted vegetables like aubergine, bell peppers and tomatoes. The salad is really good with a flavorful dressing, rich with herbs. 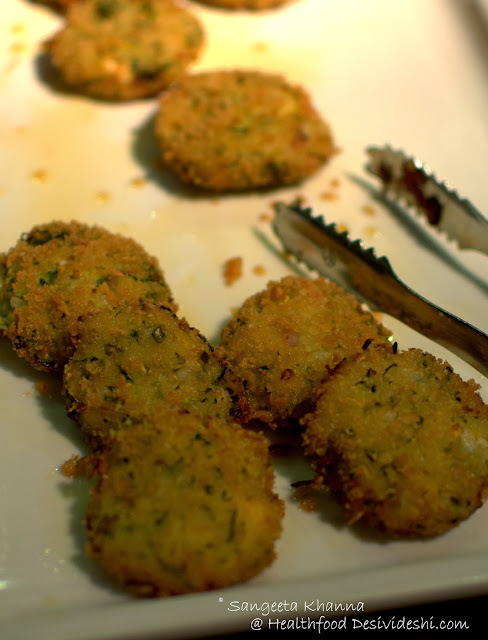 I found this Zucchini and chicken fritters really good too. I might make my own version of the fritters soon, the buckwheat and zucchini savory pancakes that I make were remembered. 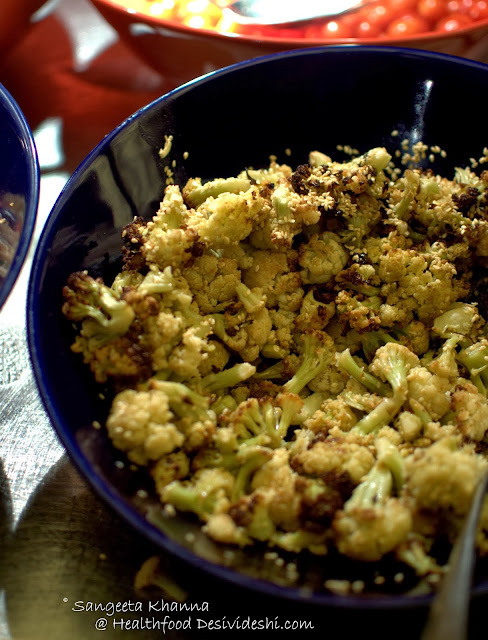 This cauliflowers and sesame salad was good. Nothing extraordinary though, a bit deficient on flavors.. 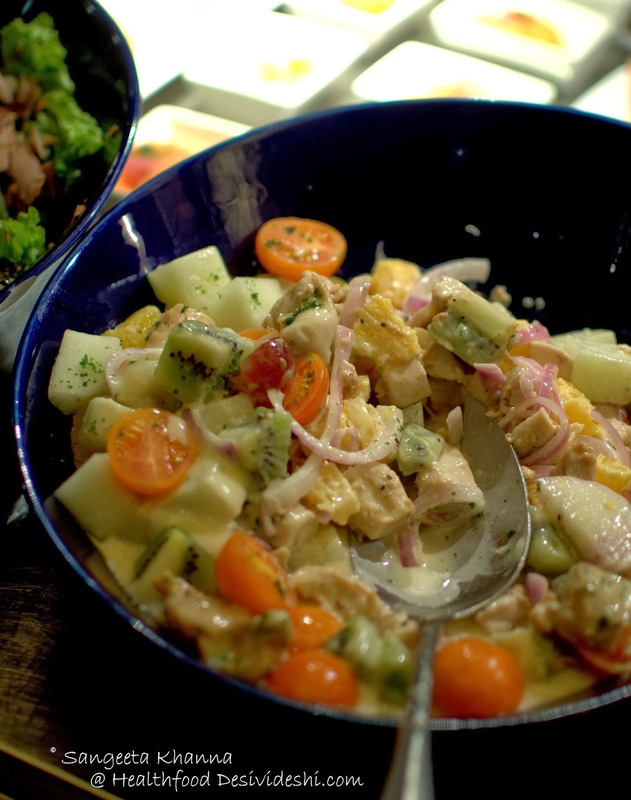 This Chicken and seasonal fruits and vegetables salad with white wine dressing was quite succulent and flavorful. We both loved it. 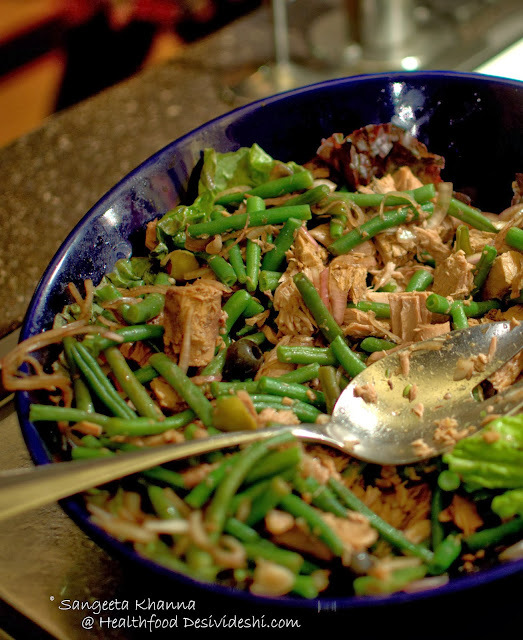 I don't like tuna salads much so this green beans and Tuna salad (Salade de Provencal) was just okay for me. I like this salad to be a bit more moist but Arvind loved it. 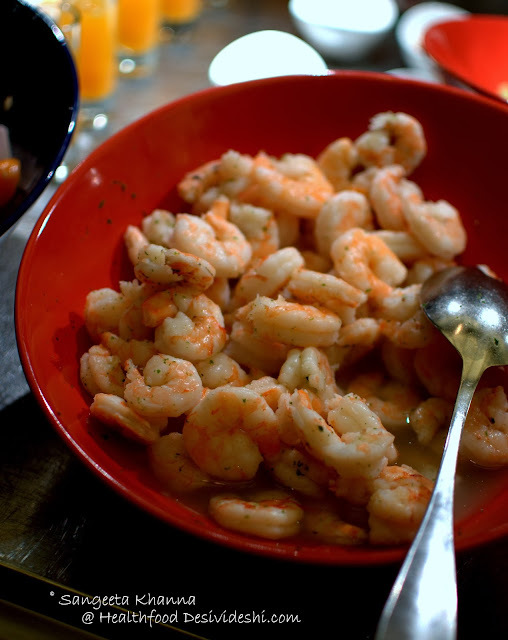 This lightly dressed Shrimp salad (in white wine vinegar and herbs etc) was a delight to have. Plump flavorful shrimps we both loved. In the main course, we started with this slow cooked stew of lamb and sun dried tomatoes, baby potatoes and carrots in red wine. Looks like an Indian curry but mild flavors. I liked. 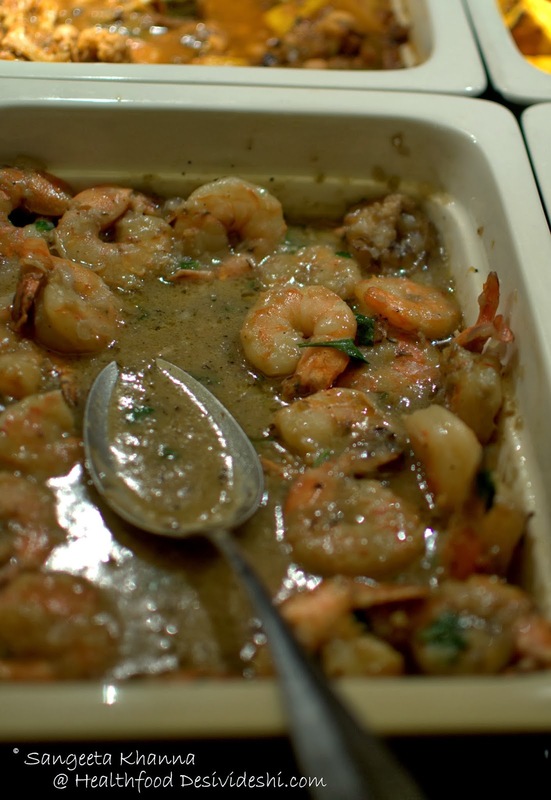 This shrimp stew with basil cream and white wine is just perfect. Each element wonderfully refreshing. 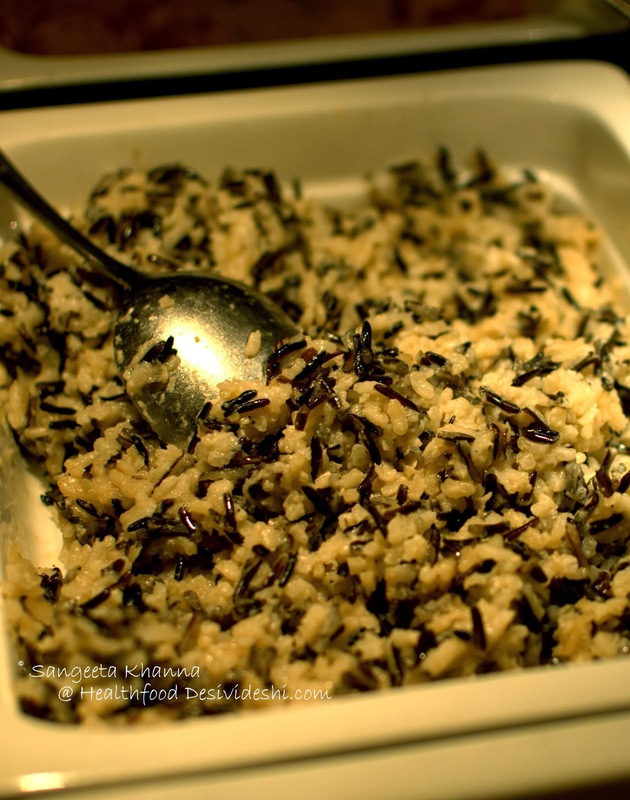 This wild rice and arborio risotto was a bit more congealed than my liking but the flavors were spot on. The rice definitely suffers in a buffet as it has to stand for some time but good that the flavors were perfect in this case. 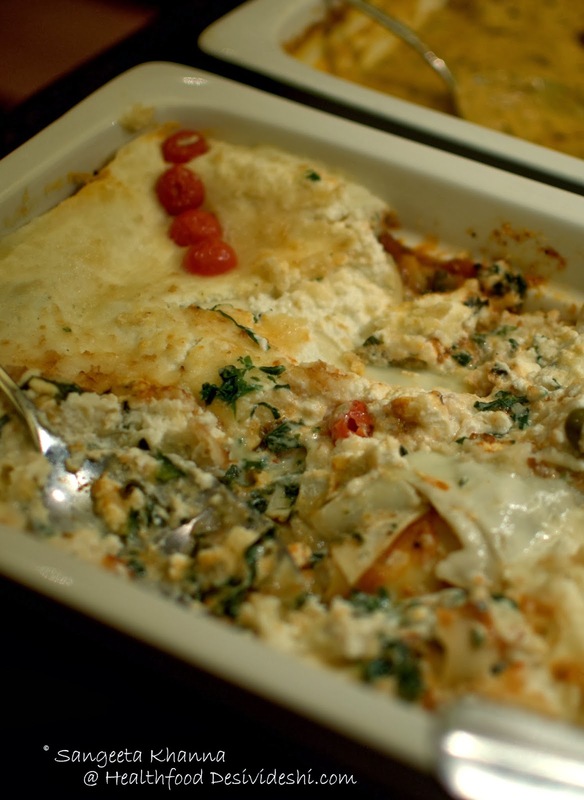 The spinach and mixed cheese lasagna was also good. Arvind was skeptical of the lasagna so he served himself some spaghetti Carbonara and loved it. Done really well I must say. 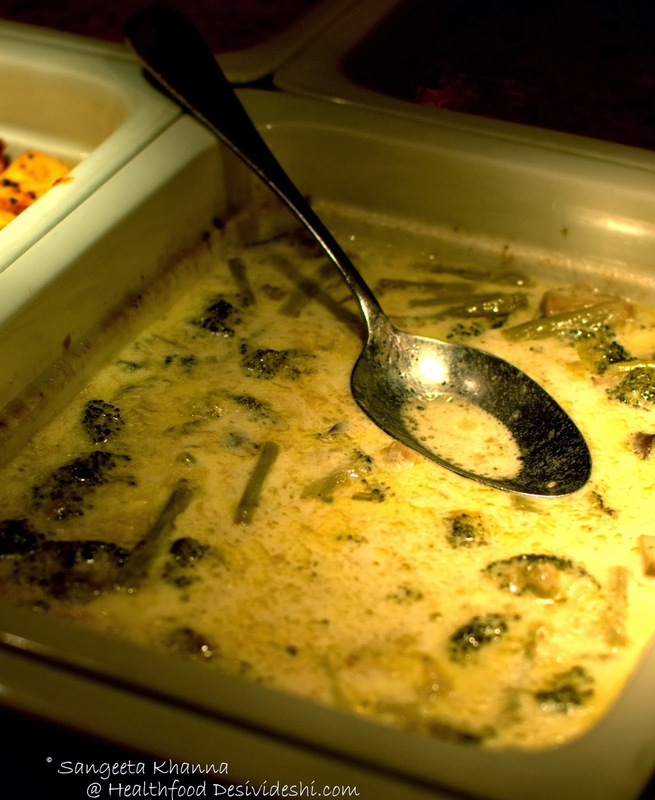 I would have liked these winter vegetables in cream sauce more if the vegetables were a bit more crisp and firm. May be this dish also suffered a long wait at the table, freshly prepared would be a lot more sense in this case. But I am not complaining, I already found a few favorites there.. The absolute favorite was this Recovery Chicken which Chef David told is served when you are recovering form an illness. 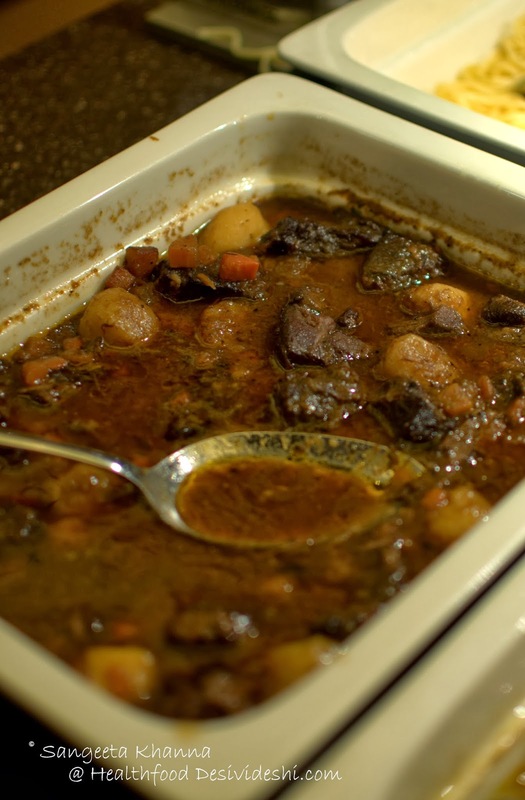 His mother's recipe and it won me over. 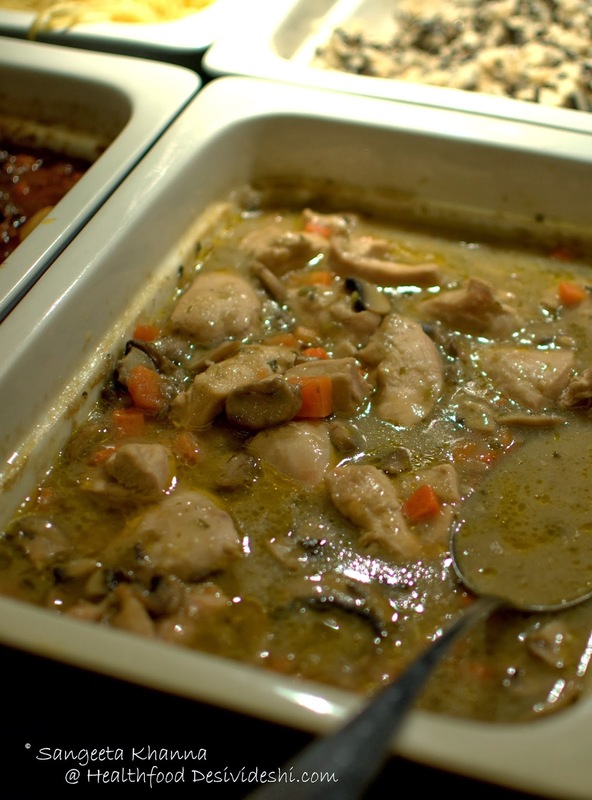 A lightly flavored stew with succulent chicken pieces and mushrooms, some carrots peeping in between. Chef David loves mushrooms too and told me he would add the mushrooms to everything if he is left on his own. I love it, may be a few more varieties of mushrooms in the same stew would make it even more my kinda stew. Saute onion and celery in butter or oil until translucent, then add flour and continue to saute until golden. add garlic and saute until aromatic. Add stock a little at a time while stirring to prevent flour from lumping. Add carrots, mushrooms, thyme, lemon zest and pepper and simmer until carrots are cooked through. Add chicken and simmer until cooked. .3 to 6 min depending on size of strips. Remove from heat and add lemon juice and salt to taste. The sauce should have some texture but not be very thick. The key is having a flavourful stock. I usually make my own. For more variation one can add another vegetable like broccoli florets or asparagus tips. Serve with mashed potatoes or fluffy basmati. 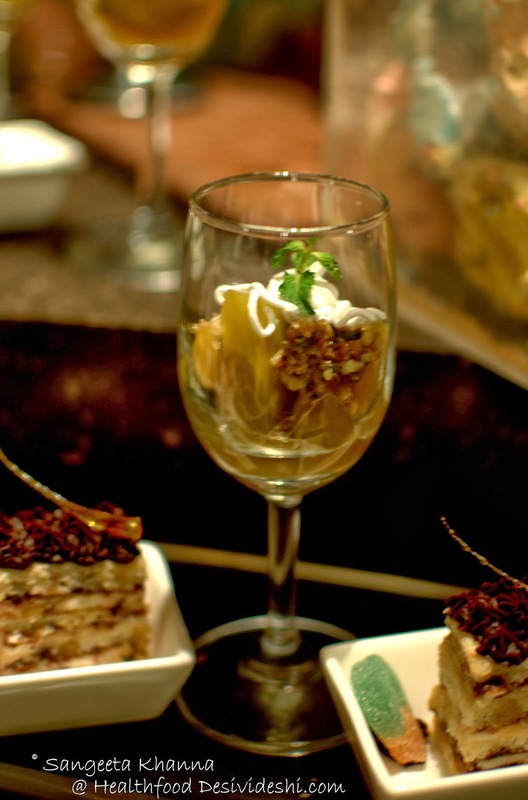 Desserts were displayed on the buffet, many of them as usual but the mediterranian specials of the day were the Hazelnut meringue cake (Bolo de Avenga Merengue) and Melba Peach. While this Hazelnut meringue cake was nice, it couldn't hold my interest much. But my opinion on desserts would not be considered right as I rarely like any dessert. Or does it make my opinion more revered? ha ha..you decide I say. Peach Melba was good, light citrus flavors with hints of clove and cinnamon. Some caramelised walnuts and a hint of cream. It was my kind of dessert as poached fruits I like with fresh cream mostly. Actually even today I had some peach melba (stewed with a hint of balsamic) with an English muffin (Buckwheat) for breakfast. You know it was totally my kinda dinner and I would want to go for it again. The Mediterranean festival is on till the end of this month so you can go and enjoy all these and more at The One, Le Meridien. Or feel free to be motivated to cook some Mediterranean food for dinner tonight. 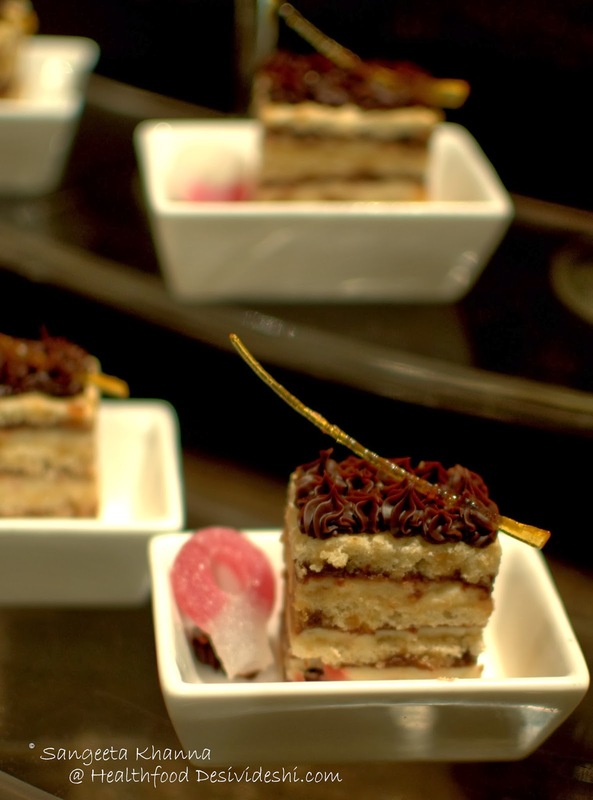 I recently stayed at the Le Meridien New Delhi - funky hotel with good (but expensive) food!